This report provides an overview of the data protection health state. It allows you to track Veeam Backup & Replication alarms triggered by Veeam ONE Monitor, and see most affected Veeam Backup and Replication jobs and components. The Total Job Issues chart displays the total number of warnings and errors for each day within a reporting period. The Top 5 Job Issues chart displays top 5 jobs that caused more alarms than other jobs. The Top 10 VMs Troublemakers table lists 10 most affected VMs and the number of alarms triggered for each machine. The Top 10 Issues table shows 10 the most frequent alarms and how many times each alarm was triggered. The Details table provides information on affected backup infrastructure objects and displays how many alarms were triggered. The report also calculates a trend for each object. It compares information on alarms triggered over the reporting period (day/week/month/year) with the number of alarms triggered during the day/week/month/year previous to the reporting period. For example, if the selected reporting period is one month, the trend will use the month previous to the reporting period to calculate the trend. By comparing two equal periods, the report shows whether the number of triggered alarms increased or reduced. Therefore, you can track data protection health state changes. Click a number in the Alarms column to drill down to alarm details. The report provides an overview of the data protection health state, shows the list of the frequently triggered alarms and displays the most affected backup infrastructure objects. 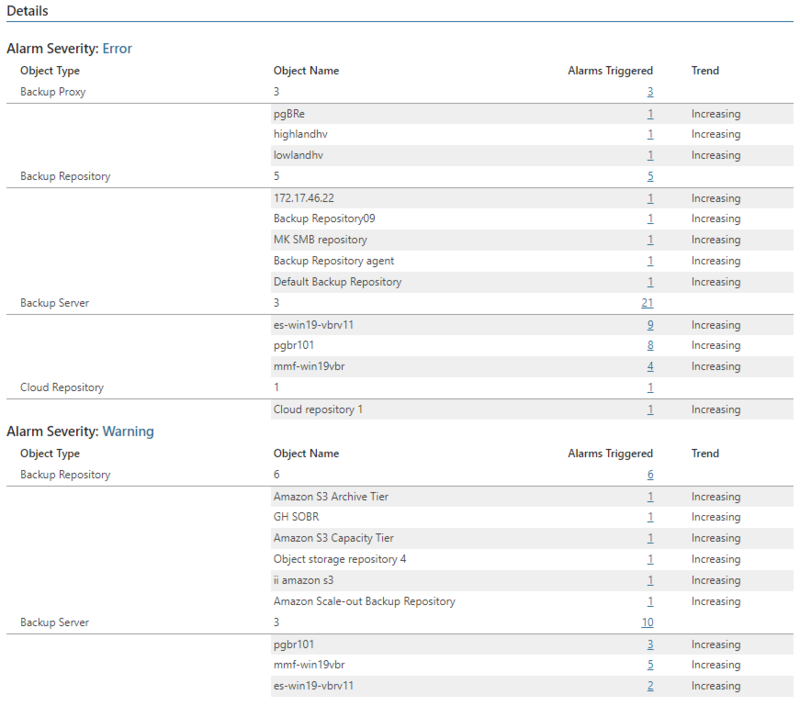 Scope: defines backup infrastructure objects to analyze in the report. Interval - Interval Type/Start Date - End Date: defines the time period to analyze in the report. Group By: defines the way data will be grouped in the report (by Issue type or Object type). Alarm Type: defines a list of data protection object types to analyze and include in the report. Alarms List: defines a list of alarms to analyze in the report. The options in the list depend on the selected Alarm Type parameter.